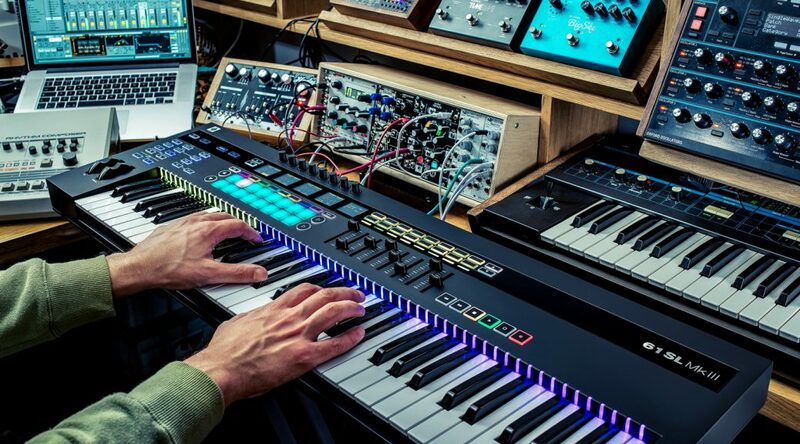 Today sees the release of the third iteration of the SL49 and SL61 controller keyboards from Novation. The MKIII is much more than your standard run-of-the-mill controller keyboard with an emphasis on being a standalone centerpiece for controlling all of your hardware! As you can probably tell, this makes the new SL MKIII series quite an attractive option for producers whether you work completely in the box or have a studio crammed with expensive hardware. The 5 beautiful OLED screens give you visual feedback on parameter changes. The 8-track sequencer really helps this stand out as a standalone product and opens up lots of DAWless possibilities. The Chord and Scale modes are integrated with the RGB feedback allowing you to instantly see what keys are in the scale – there is also a snap mode which will automatically assign whatever key you press to the nearest in-scale note. The Arpeggiator will be a welcome addition for anybody running synths without a built-in arp, I have a couple of bits of hardware myself which would benefit massively from this alone! Novations very own Calc gives us a nice little performance video exploring the connection and sequencing capabilities of this exciting new product line featuring alsorts of different audio sources. For anybody still reading who is really interested in this new release I’ve saved the biggest and most informative video till last…a massive 45 minute deep-dive by Calc. This will no doubt answer any lingering questions you may have in a better way than I possibly could! Enjoy!